Of Israel's neighbors, Lebanon always stood out by virtue of its weak central government, but for the first twenty years, 1948-68, this did not present difficulties to Israel; only when the Palestinians created a state-within-a-state there did its anarchy became a major challenge to the Jewish state, as symbolized by the Beirut airport raid of December 1968. Many skirmishes followed as well as two wars (those of 1982 and 2006). Lebanon remains anarchic and the home base for Hezbollah; it could well be a future Arab-Israeli battlefield. The powerful Egyptian state ruled Sinai with an iron fist until late in Mubarak's term when, as the Bedouin became increasingly Islamist, his regime did not keep control. Terrorism against Egyptian tourist targets followed (such as the attack on Sharm el-Sheikh in 2005) as well as against Israeli territory. These attacks increased after Mubarak's resignation, making the region a no-man's-land, and will probably continue to rise. Hamas took over in Gaza two years after the unilateral Israeli withdrawal in 2005; not surprisingly, it began shelling Israeli territory, especially the town of Sderot, leading to the Israeli invasion of 2008-09. That tamped down on the violence but the shelling continues. Although the IDF continues to patrol on the West Bank, that region has been in turmoil since 2004. 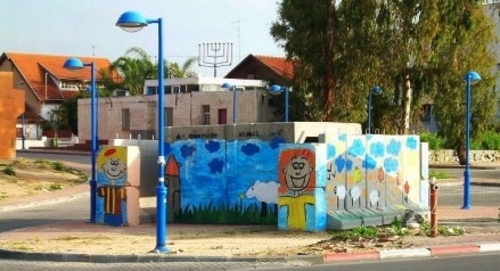 A public shelter in Sderot, painted so as not to scare the children. Now comes word from Israeli military intelligence that it expects the Golan Heights to become anarchic as the Assad regime pulls its forces for more urgent duties and various terrorist groups make hay. More broadly, the fighting in Syria has left much of the country without police or other protection, leading to an Iraq-style increase in criminality. If this is the case, then the only border left with any security is that of Jordan (where the monarchy has its own troubles). Nov. 24, 2012 update: Writing in Israel Defense, Atai Shelach notes that "collapsing Middle Eastern regimes are becoming fertile grounds for terror enclaves to establish roots," referring to Hizbullah in Lebanon, Hamas in Gaza, and proliferating groups in Syria. Hezbollah and Hamas are not alone. In the framework of the Arab Spring, terrorist entities have begun to spring up in uncontrolled territory – a phenomenon stemming from the weakened regimes. As the revolutions disrupt government order, various organizations are taking advantage of the opportunity to utilize their operational capabilities and popularity within the population to establish pockets of control. How does this method differ from the past? First, it is important to note that the terrorist groups are not new - existing groups are exploiting the present chaos. They are slowly taking hold by using state or local assets as bases to train, gather weapons, strengthen, prepare, and eventually embark on terror missions. Advanced weapons represent an essential issue in the organizations' development. One of the main goals of every terror organization is to strengthen its position by acquiring better weapons. Terror groups are working day and night to keep their weapon supply routes open: from smuggling, acquisition, theft, and even the establishment of improvised workshops for weapons production. In most cases, they invest considerable energy to obtain advanced state-level weapons to upgrade their operational capabilities and to advance their world standing. In this new reality, the time needed to obtain weapons and operational capability is very short. Usually, terror organizations need considerable time to achieve operational readiness due to geographic constraints, close supervision, the absence of training facilities and available weapons, and other reasons. In this new reality, the organizations already exist, training facilities and "fire areas" are abundant, supervision is lax, and weapons (including very advanced ones) are relatively available – allowing terror organizations to reach operational effectiveness very quickly. Iran's involvement in Syria and Iraq could distract it from its nuclear project. ... Hezbollah has lost fighters in Syria and faced setbacks in its standing at home in Lebanon. Hamas, the Palestinian militant faction that controls the Gaza Strip, has been severely weakened by the new military-backed government in Egypt and its crackdown on the Muslim Brotherhood. Syria's military capacity has been greatly diminished. Dore Gold, a foreign policy adviser to the prime minister: ""The most important lesson from the last few weeks is that you cannot rely on a snapshot of reality at any given time in order to plan your strategic needs. The region is full of bad choices. What that requires you to do is take your security very seriously. And you shouldn't be intimidated by people saying, 'Well, that's a worst-case analysis,' because lately, the worst is coming through." Halevy wants to take a picture of the present, Gold warns not to expect it to stay still for long. My take? A combination of the two: from Israel's point of view, so far, so good, but things could turn very sour very fast. The Palestinian Authority has been threatened by the rise of militias that have taken over key areas of the West Bank. Palestinian sources said nearly a dozen major militias have become active throughout the West Bank over the last two years. They said most of the militias were linked to Fatah leaders and meant for personal protection as well as racketeering and illegal drugs. "The militias are first and foremost about power," a source said. "It is really organized crime."